One of the biggest barriers to exercise is time. Do you think you have to exercise for at least 30 or 60 minutes for it to be worthwhile? Do you have an all or nothing attitude about exercise? If you can’t go to the gym 5 days a week for 60 minutes do you not go at all? Sometimes our view of what constitu tes exercise is narrow or we associate exercise with dieting. We will cover this topic another time. What I would like to share with you are some of the many benefits of just of 10 minutes of physical activity and some tools to help you get started and stick with it. Your body does not know the difference between walking for 30 minutes all at once or 10 minutes 3 separate times throughout the day. In some cases, breaking exercise up throughout the day can be beneficial. A recent study from Arizona State found that walking for 10 minutes in 3 separate blocks was more effective at managing blood pressure than walking for 30 minutes all at once. Multiple studies have shown 10 minutes of walking can improve heart health. Doing 10 minutes of strength training exercises 3 days a week, you will see improvements in strength and muscle tone. 10 minutes of cardiovascular exercise can help lower cholesterol. 10 minutes of brisk exercise triggers metabolic changes that last beyond 10 minutes. Meaning your metabolism will increase for an hour or longer following 10 minutes of brisk exercise. Pick a time of day when you have the most energy. If you are a morning person try getting up 10 minutes earlier. Does it little longer to get your engines going? How about taking 10 minutes out of you lunch break? If you perk up after five o’clock, enjoy an evening walk with your partner, your kids or your dog. Tired and having a hard time getting started? Simply tell yourself “I am just going to go for a few minutes and see how I feel”. 99.9% of the time, you will feel better as you begin to move. Losing motivation? Ask yourself why you want to be physically active. All of the benefits above are wonderful and they may or may not be motivating to you. What are your personal motivators? A pros and cons list can be helpful in What do you gain if you choose to exercise? What do you gain if you choose not to? What do you lose if you choose not to exercise? What do you lose if you do choose to exercise? All or nothing thinking usually leaves you with nothing. A healthy lifestyle is a long-term process, not a short-term pledge of perfection. If you find yourself engaged in all or nothing thinking, re-frame the little voice in your head. For example, re-frame “I missed my walk 3 days in a row. What’s the point of going today, I will never stick with it.” to “Even though I missed the last few days, I know I feel better after I go for a walk and every step I take adds up over time.” It takes time to learn to re-frame your thoughts but the cool thing is that the more you do it, the more your brain will rewire itself to think more positively. Get a walking buddy. Walking with a friend, family member or co-worker can help you both stick with it and motivate each other. Have a dog? Fido needs exercise too! Whether you are just starting out or a seasoned fitness buff, the Power of 10 is good for all levels of fitness. If you are just starting out, take your time. Pay attention to how you feel before, during and after exercise. If 10 minutes it too much, start with what you can do. You will be amazed at how fast you can build up to 10 minutes. If you are a regular exerciser and want to take things up a notch increase the intensity of your walk by picking up your pace, add what I call wogging, alternate between jogging and walking. Not a jogger? Add some hand weights, stairs or hills to your routine. 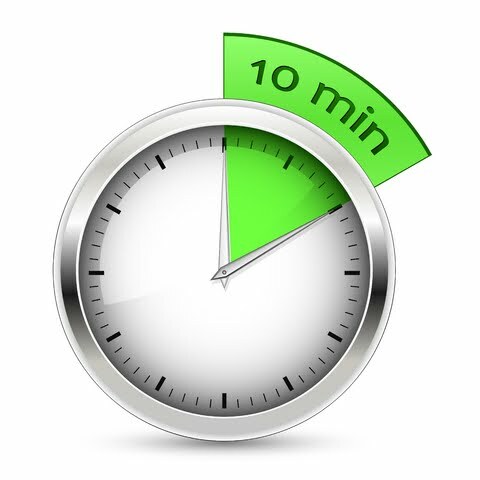 Now that you know about the Power of 10, where can you fit in your 10 minutes of physical activity?